This book deserves to be promoted to classic status immediately. It is written clearly, it uses only good principles of programming and adheres strictly to the appropriate standards. What a combination. I highly recommend this book. It's nothing short of a revolution in educating developers about the true potential of DOM Scripting. The book is written for the XHTML/CSS designer, rather than for programmers. It's already paid for itself. Go get yourself a copy. If you design Web sites and want to add another dimension to it, check out this book. You won't be disappointed. No other reference book is nearly as descriptive when dealing with the DOM. Keith successfully turns a potentially difficult topic into a comfortable and easy read. This is achieved by a concise writing style reinforced by a strong narrative voice. Since I had to be in Tokyo yesterday, I perused it on the train. The book is so well-written and every concept explained clearly that I not only finished it by the time I got back to Tsukuba but I have it still fresh in my mind a day later. It's very rare for me to breeze through a non-fiction book and it is a credit to the author. For designers who find “programming languages” hard to grasp this book is ideal. Clearly written and aimed at designers you'll find it impossible not to learn something. Jeremy Keith has managed to craft a book that is both a great learning tool for those new to the subject and call to arms to those of us that have always believed that scripting has its place in modern web design. DOM Scripting by Jeremy Keith is the perfect introduction to the language. It's a rare book that will easily double as an introductory text, as well as a proper reference for best practices and proper implementation. The book is very good and worth getting. The author has a clear and concise way of presenting the subject and I really enjoyed the read. Rather than trying to be all things to all people, DOM Scripting sticks to the topic at hand, and does an excellent job explaining it. I would highly recommend this book to anyone who is comfortable building HTML pages and is ready to get into scripting. I'd definitely recommend the book to anyone who wants to begin adding another weapon (DOM scripting) to their web-standards arsenal. Normally, books on coding aren't the kind that I actually sit down and read, but rather are used as a reference for when I run into a problem. This one was different. While I still haven't gone through every line of every example, it had the same effect on me as Jeffrey Zeldman's Designing with Web Standards : that is, it made so much sense as to seem ridiculously obvious. I am about halfway through the book and would like to recommend it to everyone. I am now glad to say it has made an excellent addition to my bookshelf. Die 300nochwas Seiten von DOM Scripting habe ich an zwei Abenden durchgelesen, ausprobiert, verstanden, obwohl sie in erster Linie Text sind. Sure, there are plenty of articles and tutorials online, but none of the many that I've read were as clear in their explanations as Keith's book. This book explains things in a clear, deliberate manner and with a good balance between theoretical and practical. There is no question that this book should not be given the praise that has already been heaped upon it and I would like to add my own. It is a great book. I rate this book 9/10 both for the quality of its message as well as the ease with which this message is delivered. For those of you who are web developers and do not have this book, GET IT!!! I cannot recommend this book enough. Für Webdesigner wie mich ist es ein tolles Buch, dass an schönen Beispielen erklärt, wozu man diese Technik nutzen kann, wie sie sinnvoll eingesetzt wird und wobei man besonders aufpassen muss. Balancing a perfect blend of theory, practice, and application development, DOM Scripting is everything you need to start working with DOM. This book definitely gets a 10/10. The reason for enjoying this book so much was the way it spoke to me; I wish 4.5 years ago when I started my degree there had been a text book or a lecturer who could have explained basic programming to me in the way Jeremy Keith does in this book. The whole book is well-written and easy to follow. Like most really good hands-on books, DOM Scripting makes you eager to start putting what you've just read about into practice, making your own scripts more efficient and less obtrusive. There are a few books that can be unanimously placed in the "You Should Really Have This in your Library" category by Web designers/developers. 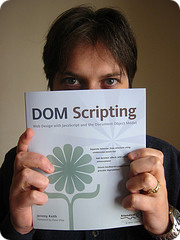 DOM Scripting by Jeremy Keith, in my opinion, is one of those books. Jeremy Keith is the David Attenborough of web design. His way of explaining how things work is delightful and intruiguing, making something that is inherenlty fascinating even more so. If you want to get the basics of DOM scripting, it really couldn’t have been explained better. He does a fantastic job. Jeremy writes in a very easy and readable tone that makes it all painless.